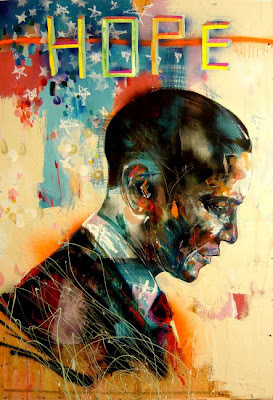 Well, as you all know, there’s a lot of Barack Obama-related art out and about. I might send links back and forth with my good friend Julia comparing the quality of the pieces and wishing that we had major $$$ to drop on our favorite prints and pieces. The following is one of my favorite pieces of Obama-related art. It's by David Choe. They pay you for speaking your mind. Tag, you're it: Pass it on. She's a thug and intelligent too. Photo Source: Margarita Barrett.